Soil testing conducted in recent months by the U.S. Environmental Protection Agency found elevated levels of lead in the yards of nearly half of the homes sampled. They are all located near a bulk storage facility that has come under federal and local scrutiny for pollution-related issues. Of the 100 homes sampled by the EPA, 42 had lead levels in the top few inches of soil exceeding the federal cleanup standard for areas where children play, which is 400 parts per million, according to data released by the agency this week. Two of those yards had lead above levels that can trigger an emergency cleanup, a standard set at 1,200 ppm, according to the data. The federal cleanup standard of 400 parts per million for lead was designed to ensure that children’s blood lead levels remain below 10 micrograms per deciliter, said Debbie Chizewer, an attorney at Northwestern Law’s Environmental Advocacy Center who works with Southeast Side groups and residents. No amount of lead exposure is safe for children, according to both the EPA and the Centers for Disease Control and Prevention. The EPA says lead exposure can cause a range of negative health effects and is particularly dangerous for young children, whose nervous systems are still developing. Even low levels of lead in the blood of children can lead to behavioral and learning problems, low IQ, hyperactivity, stunted growth and hearing problems, according to the agency. An EPA spokesperson said the agency has completed soil sampling in the area and is continuing to analyze the results and mail them to residents. No decisions have been made in regard to removing contaminated soil, the spokesperson said. The agency expects to have all results mailed to residents by the end of the year. 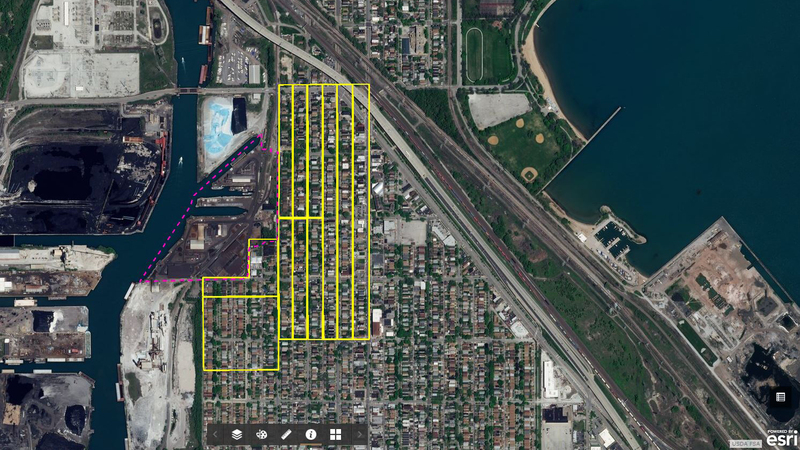 The EPA began collecting soil samples in May after testing conducted by Chicago’s Department of Public Health revealed high concentrations of manganese at homes near S.H. Bell Co., a Pittsburgh-based company that stores manganese and other materials along the Calumet River. The EPA cited S.H. Bell last year with violations of the Clean Air Act for releasing high levels of manganese dust into the surrounding neighborhood. Also last year, the company was required to install air monitors as part of a settlement reached with the EPA over previous Clean Air Act violations. Nearly 20,000 people live within a mile of S.H. Bell’s facility in predominantly minority, low-income neighborhoods. Of those residents, more than 6,000 are children, according to EPA data. In addition to lead, the EPA’s testing near S.H. Bell found 35 homes with manganese concentrations exceeding a screening level used by the Illinois EPA to assess health risks, which is 1,600 parts per million. Four properties had manganese levels above the federal emergency removal threshold of 5,500 parts per million, according to EPA data. In response to the high manganese levels found during the city’s soil testing, CDPH officials said residents should take several precautions to limit their exposure, such as taking off their shoes before entering their homes and cleaning floors and countertops regularly to remove dust that could contain manganese. In a statement Friday, S.H. Bell said that based on analysis conducted by Gradient, an environmental firm hired by the company, “there is absolutely no health risk associated with the manganese levels in soil samples” collected in the area.